Those early mornings can really get to you, with the angry alarm and the lack of sleep. When I’m up at half six in the morning and blearily trying to make my face look more presentable, I don’t always feel like going for some crazy colours on the eyes. I like to go for a bolder lip – which I can apply on the train, thus saving time – and then some sort of eyeshadow that requires no brain power. Almost everyday, I apply MAC Groundwork paint pot all over the lid – it’s a semi-matte mid brown kind of colour. It’s not too cool, or too warm, so it works under pretty much any eye look. It’s creamy, and you could easily apply it all over the lid on its own, but I normally layer powder shadows over it. It’s just so easy, you don’t need a brush and you can just smudge it on with your fingers. And then wipe the excess off on your arms and have a weird smudge all day. Standard. On top of Groundwork, I have three main options that are rotated and all equally grabbed for. Tom Ford Cocoa mirage. One word: lush. Three matte shades and one shimmer, this quad is just amazing. Sarah and Aimee basically made me buy it, and I am grateful. It’s warm-toned, it’s flattering and I do feel pretty fancy swishing this all over my lid. Amazing quality, just amazing. If you can bear to spend that much on eyeshadow, I urge you! The NARS Kalahari duo s a metallic bronze colour, and I normally use the left shade – I’ve actually hit pan so you can see how much I love it. So nice! NARS shadows are the nicest, and the duos are so easy – with this one the shades are pretty similar so wouldn’t maybe go amazingly on the lid, but loads of the duos have colours where you can put one on the lid and one in the crease. Kalahari is still my favourite though. Burberry Pale Barley is one of those famous blogger shades that everyone loves, but it’s OK, because it’s legit. Trust me, this shade is such a nice one shadow wash all over the lid that really easily makes your eyes look polished and all sheeny shiny. Burberry shadows are very nice, and a bit powdery but they blend softly. It’s just so easy, and definitely a good no brainer shadow. Now, MAC. Obviously. Bronze, Amber lights, Woodwinked, Blackberry and Club. All amazing, and all an essential. Blackberry is the only matte one, and the one that goes in the crease with basically any shadow – it’s really versatile. 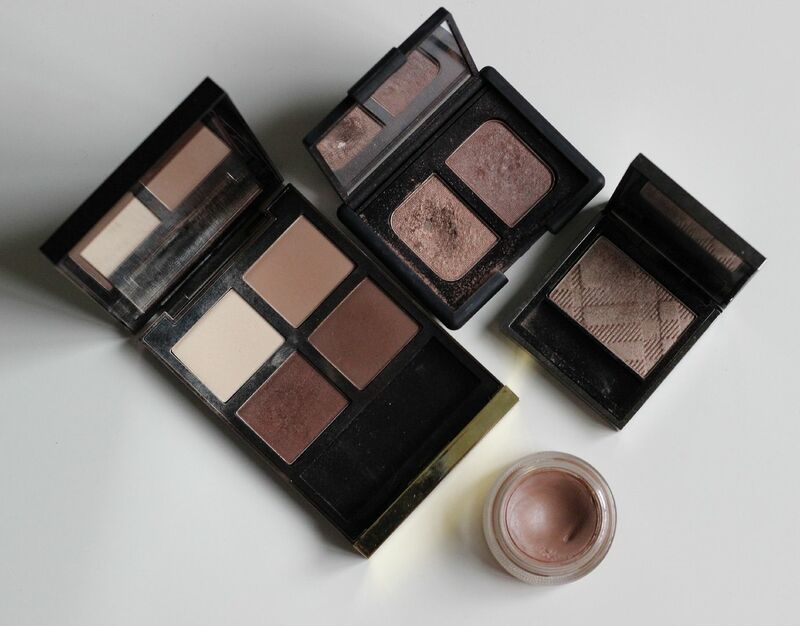 I love me some warm shadows, and these all are good for blue eyes – or any eyes basically. MAC shadows are a good consistent quality, and pretty dreamy. 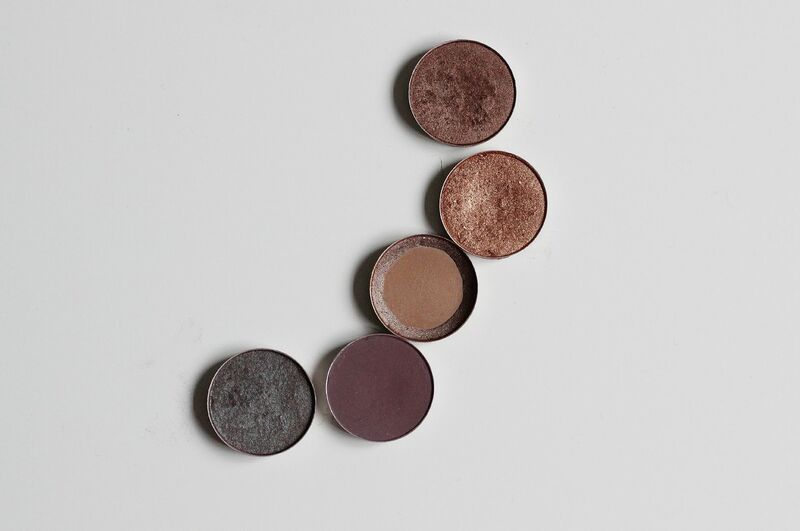 What eyeshadows do you reach for regularly?